Richard Olsen, a veteran architecture book editor and the former senior architecture editor for Architectural Digest, is the author of Handmade Houses: A Century of Earth-Friendly Home Design, a 2012 ForeWord Reviews finalist for architecture book of the year. 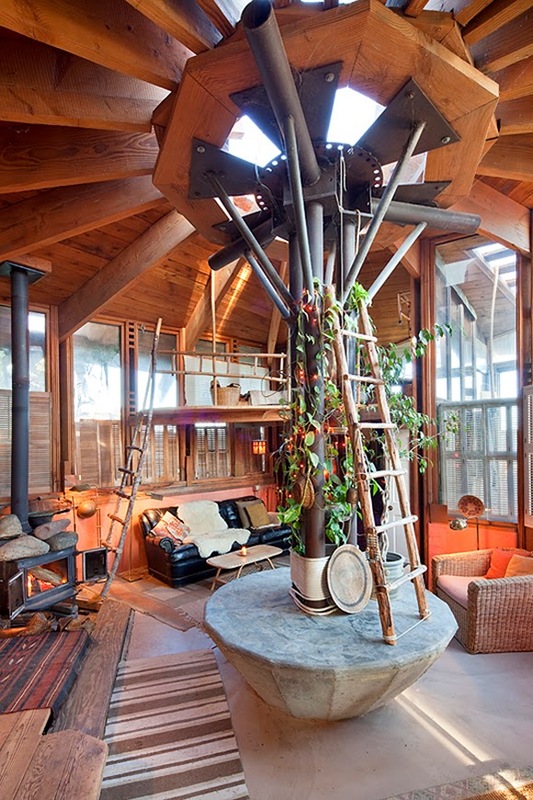 Olsen’s next book, California Green: Houses of the Eco Movement, from Handmade to High Tech, is to be published by Rizzoli in 2015. First things first. Where did you grow up? I was born in 1969 in NYC and grew up there and, later, in Texas. When did you become interested in art? Was it a product of your childhood or something found later…and when did architecture strike a chord? Art, music, design, and construction have been important in my family for generations. My great-grandfather and my grandfather, each born in Norway, were trained as master carpenters in the Norwegian tradition and were fluent in the use of 19th-century European hand tools. I was fortunate to have been around them enough, one on one, to learn from them at an early age. And my father was a carpenter and musician and painter, and I still have furniture that he miraculously designed and built in the hallway space of our tiny NYC apartment when I was a kid. Without this background, I don’t know that I’d find the handmade house stuff so engaging. 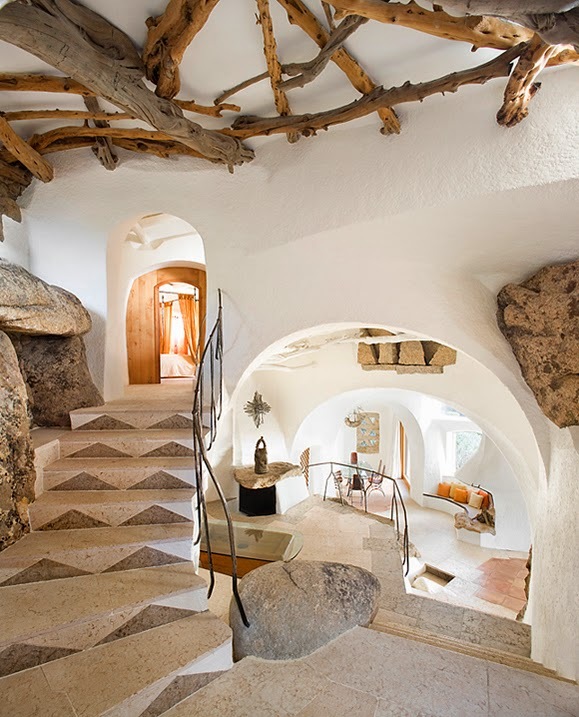 In your book “Handmade Houses: A Century of Earth-Friendly Home Design” you focus solely on green design… can you tell me about the progression from having the idea to then preparing… to hitting the ground for field work… and then writing and finishing the book? My first book as an author or coauthor was a book with the architectural photographer Julius Shulman called Malibu: A Century of Living by the Sea. This was a project I conjured while working as an architecture book editor, as a way of hanging out with and working alongside the great Shulman — and ended up, because of Shulman’s advanced age, doing more than the editor’s job (Shulman was 90 when we started). During this same period, driven by my experience in New York during 9/11, I’d become passionate about back-to-the-land architecture. In 2004, the same year I started working on my second book, Log Houses of the World (2006, Abrams Books), I began casual field research for my 2012 book Handmade Houses. In the making of the log cabins book, Poland-based photographer Radek Kurzaj and I toured about 20 countries in his station wagon, including Norway, Sweden, Finland, Germany, Switzerland, Austria, Poland, and the Slovak Republic, documenting some of the greatest log houses ever built, some dating to the 1300s and still standing! Talk about sustainable architecture… Once that work was completed, by late 2005, I shifted back to Handmade Houses and have been researching eco architecture, particularly those spirited 1960s and 70s counter-cultural developments, ever since. What is most inspiring to you about the pioneers of homemade house design during the 60s and 70s? Most inspiring of all might be the handmade-house pioneer’s bold tendency to settle in remote rural locations where he, his wife or partner, and their close friends could get together and build it themselves, away from convention, away from conveniences, away from building code inspectors. They’d let the “personalization,” the individualism, extend to the architecture itself, the very structure, not just the areas that tend to receive our personal flourishes today: the furniture and the window treatments and the carpets and other soft furnishings. Above these homes being visually some of the most incredible feasts for the eyes and imagination, what do you think a beautiful crafted (green) home can give back to its dwellers? Carl Jung wrote of being able to see himself in his handmade house in Switzerland. 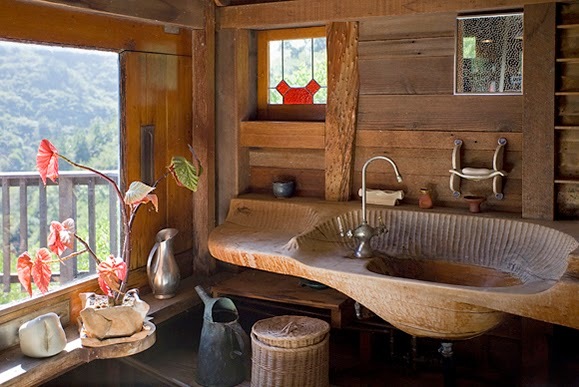 And there are examples like California handmade-house pioneers Dean and Louise Pratt, who got their children directly involved in the building of their family home. So now, decades later, although their sons and daughters have moved on and built homes of their own, Dean and Louise can at any time walk past that doorway carving in their kitchen or that portion of the butcher-block floor in the dining room that their son or daughter created and feel his or her spirit and energy, his or her love. Because it’s embedded in the DNA of the building! You don’t get that with a house that’s been prefabricated in a factory. Does your love for sustainability stop at homes or does it transfer to foods, art, technology… a lifestyle on all accounts? 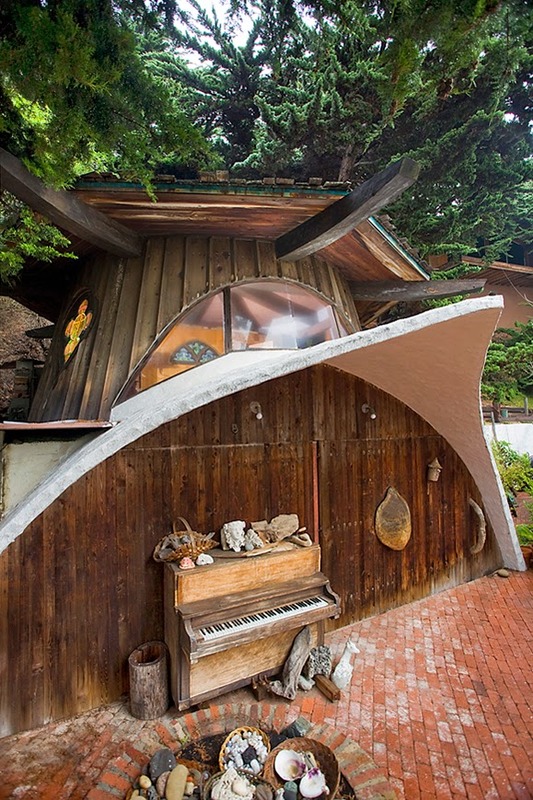 I’m now working on a new book for Rizzoli about the history of eco architecture in California, a book that goes from the 1920s adhoc barns and shacks of California’s painters, poets, and radical intellectuals to the 21st-century technophiliac-consumer’s smart house, a book I’m calling California Green. But for me, “Green” and “sustainability” are little more than marketing terms now. And “eco chic”? I’m not sure what these words mean. I’m trying to find a replacement. Maybe your readers can help me there. [laughing] For me, by necessity these concepts extend well beyond housing, and honoring them tends to be about buying products that I’ll be able and eager to use over the long term. It’s about buying fewer products but maybe spending more money or more research time to get them, because they’re better made. Among all the homes and people you visited, has there been a single family or person that has stood out to you as extraordinary in this field of DIY home building? Any serious conversation about DIY home building has to deal with Lloyd Kahn—his influence on that culture. When it comes to counter cultural design and construction, I don’t think anyone’s more “extraordinary” than Kahn. From his own self-built houses to his days in the late 1960s as the editor of the “shelter” section of the Whole Earth Catalog, to his geodesic dome phase, to his 1973 book Shelter, and on through to his recent books, including 2012′s Tiny Homes, Lloyd Kahn has carried this torch. 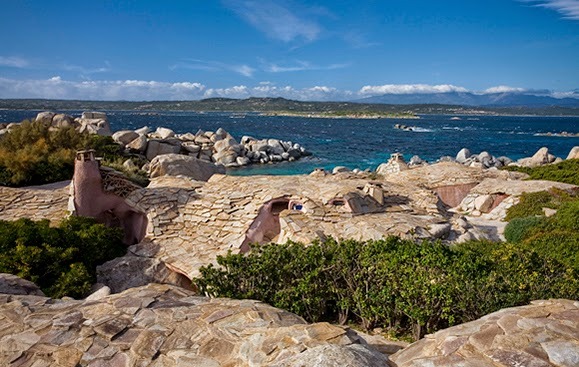 In eco architecture and architect-designed handmade houses, the starting point for me is Sim Van der Ryn. In the DIY home building world, Lloyd Kahn is the towering figure. And maybe even better than all that, in his seventies Lloyd does downhill skateboarding and rides a surf mat! Architecture and Design, as a scene, can be rather elitist—alienating to many. If you are getting into it, or even if it’s already among your passions, don’t make the mistake of limiting yourself to merely what you see in the magazines. Keep in mind that what you’re seeing there is an advertising-dictated formula; it’s far from the whole picture. There’s more to “design” than Bauhaus furniture or the Glass House or Prefab Modern. For ideas and inspiration, look at the live/work spaces of the culture’s artists, old and new, established and struggling. There, you’ll often find inventive design solutions, often done wittily with unexpected, low-cost materials. Sometimes, it’s infinitely more rewarding, much more cool, if you throw caution to the wind, put down the handheld device, and take the time to try to dream it up and make it for yourself.